I am in no way associated with GT Trends Travel, so this is not a biased review. I do not have any financial gain as to whether you sign up or not. I am here to provide you with the details regarding GT Trends Travel so you will make the best decision possible. I will not label Gt Trends as a Scam. There are people with positive reviews along with it’s share of negative reviews as with most businesses. What happens when joining GT Trends Travel is that you have your own travel store. 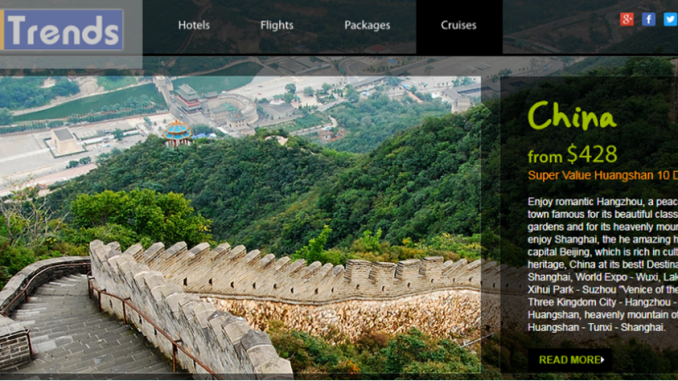 This travel store is found online and linked with the GT Trends travel website. As an Associate Travel Agent with GT Trends, your personal ATA Travel Website is linked with the top travel booking engines from around the world where you and your customers can book cruises, hotels, flights, rental cars, all inclusive vacations and other travel related products. The Complete Business Builder product package is $299.00 and contains the Online Associate Travel Agent (ATA) Training Manual. Only the Business Builder status may be immediately eligible to earn all bonuses. All product packages agree to a one time $49 business set up fee upon purchase. There is a monthly fee of 19.95 to maintain the business. As an associate travel agent you are able to get hotel rooms at a 50% to 75% discount for you and your immediate family when you travel. You can also receive free upgrades in rooms when available. You also get car rental discounts such as 15% to 30% off. Cruises offer a $50 a day discount for most of the options on the GT Trends website. This means you can get up to a 70% discount on cruises. On GT Trends website, they market themselves as having 8 ways to earn, but in reality there are 3. Team Bonus: Every 3 members you recruit that pays the 19.95 monthly fee will earn you $10. Travel Commissions: As an Associate Travel Agent with GT Trends you will have your own personal ATA Travel Website linked with the top travel booking engines from around the world where you and your customers can book cruises, hotels, flights, rental cars, all inclusive vacations and other travel related products. You will receive up to 50% of the travel commissions generated by purchases on your travel center website. For the prospect of making a long term potential income, I would recommend you to check out my #1 recommended online business opportunity. This opportunity provides you with the knowledge to start a successful online business with a broader option of products to market including travel if you want. As always, I welcome your comments on GT Trends and I will be more than willing to discuss it with you. If you have ever joined Gt Trends, feel free to share with us your personal experience in the comment section below. That sounds good but what guarantees or security do these sites offer? the reason I am asking is that there are many travel scams out there and most people would be more prone to use the known name sites before they would use a site with no history. This is not an opportunity I would personally recommend. There are more known websites as you mentioned and there are better ways to sell travel through internet marketing. This sounds like a multi-level marketing setup, I have found with all of those that I have experience with the top tier makes the money while the lower ones struggle to get new folks signed up and eventually run out of prospects and as you said there are many ways to book online without an agent. I think if a person were wanting to make money online the link to your #1 recommendation would be a better choice. Thankyou. I once was a part of a similar opportunity and I would have to agree with everything you stated. The sooner you join the more likely you are to be on top before everyone else start to join. I’m so happy I came a cross your review. It’s not about joining a program and paying the fees, it’s about making sure you’re not wasting your time on a platform that won’t help you achieve the results you were looking for. I definitely wasted over a year in an mlm travel opportunity. I learned from my mistakes and I will definitely do more diligent research if I ever consider doing it again. That’s why I try to inform everyone and guide them to better choices. I would have to agree with you Max. There are many great travel sites out there these days, it’s actually a lot easier for people book travel themselves – myself included. Personally, I wouldn’t bother with GT Trends. I’m no fan of selling to friends and family, and by no means a good salesman either. There are much better ways to go about doing business. Great review, you’ve done an awesome job so keep it up. Thanks I am glad you enjoyed the review. GT Trends is one of the less known multi level marketing companies in the travel industry, and even if I was to join something like that I would choose a different travel club.